The odd name for this part makes more sense when one refers to the original MME description, "Bush for wheel". This was intended as a central hub, around which a wheel could be constructed with strips for spokes and/or a cardboard disc. The word "for" was dropped by 1904, and the part was known as a Bush Wheel from then on. The bush wheel (top left) was included in the very earliest MME outfits. 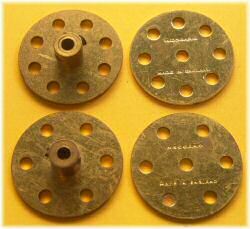 In 1932, as part of the ill-fated budget X-series outfits, a small steel disc with eight holes (and one in the centre) was introduced. This part was transferred across to Meccano as part number 217a. Another part (219) was at that time named the wheel disc (later called the conical disc), but both of these were dropped and in 1945 the new part 24a Wheel Disc was introduced into outfits. This part was identical to the bush wheel, but without the boss, and is shown top-right in this photo. In 1954, the 6-hole bush wheel and wheel disc was introduced. This allowed many more mechanisms to be built because of its 60° rotational symmetry, in particular it was useful for clocks and spur differentials. These parts are shown in the lower half of the photo. Part number 518 is also a 6-hole bush wheel but only 1'' overall diameter, nickel plated, and thicker than the others. This part was introduced in the Electrikit and later in the equivalent 4EL outfit. It subsequently gained a new use as one of the parts of the three-part road wheel p/n 187c, supplied in the 1978/79 outfits 3, 4, 5, and 10. Thus it is also found in matt brass and iridescent finishes. These pictures show a range of parts (24, 24b, and 24c) in post-war yellow spare parts boxes. The boxes all contain product codes, dating them from at least 1954, but since the parts within are brass these labels remained unchanged right through the light red/green period, so they could easily be early 1960's parts. To the right, a pair of instantly datable spare parts packs of parts 24 and 24a. The light green sticker with black dashed line marks these as blackened steel parts from the Korean War period (1951/52), due to the restrictions on the use of brass and nickel at that time. These are "old style"bush wheels David and appear to be fairly common. I have 3 wheel discs 8 holes dark red diameter 1" and a quarter only, its appear also in French catalog 1951/52 as part number 217a. 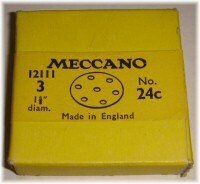 I have recently been buying lots of "Meccano" on E-bay in an attempt to build up my collection. Of course this is a risky enterprise as there is a lot of repro and 2nd string parts in the wild. In an attempt to validate the parts I have I have come across the following part 24's which appear to have a raised boss on the wheel side as well as a standard boss on the other side. They are stamped Meccano three times equi-angular around the wheel close to the boss. Are these parts from some special kit or do they have a legitimate place in the parts archive. I have 6 hole and 8 hole wheel discs from a 1950s set, diameter 1 and seven sixteenths inches; also bought separately RED 8 hole wheel discs stamped Meccano bought separately, which are only 1 and a QUARTER in diameter. I don’t think you mention the different diameters. Looking at a list of parts from the late 1930s, part 217a is shown as 1 and a quarter inches. The larger ones are called 1 and 3 eighths in 1950s manuals,whether 8 hole or 6 hole (and they are both the same diameter, definitely bigger than the red ones). I see some mention of this now in the "Individual part nos", but I don't think it has due prominence in your main account, because they seem quite different. No, 5 hole bush wheels are non-standard compatible parts.